≈ Comments Off on WHAT’S YOUR CONDO IQ? If it’s high when it comes to expecting something unique in an incredible location, then consider IQ Condominiums, which was recently launched by Remington Homes at Queensway and Islington in Etobicoke, and has been an immediate success. Already, more than 70% of the suites in both towers have sold, and there is still an excellent selection available. And soon, Remington will release the podium suites for a tremendous “one-price plan.” Considering how quickly this condominium is selling, you will want to register now for this incredible new opportunity to own. The master-planned IQ condominium community is situated only minutes from the waterfront and downtown Toronto, so residents will have quick, easy connections to all parts of the city. It’s just a five-minute drive to Sherway Gardens, one of Toronto’s largest malls. There are many parks in the vicinity, as well as the lovely Humber River ravine. The first phase of this community includes two boutique 12-storey mid-rise condominiums anchored by a 6-storey podium. The exterior will be dazzling, with iridescent glass and precast accented with blue-tinted balconies. At ground level, their retail venues will encourage pedestrian traffic and contribute a new vitality to this area. IQ itself will be constructed to the latest environmental principles. For example, the floor-to-ceiling windows will maximize heat and light, as well as provide gorgeous views of the lake and the city. Polished inlaid tile floors, exotic accessories and lushly planted containers in the grand lobby will offer a magnificent first impression, and 24/7 concierge service will provide convenience and peace of mind. A rooftop terrace garden complete with barbecue stations and fantastic views will be available for get-togethers in the nice weather. When grand entertaining is called for indoors, the beautifully appointed party room is perfect with its wet bar and caterer’s kitchen. IQ will also feature a pool and deck lounge equipped with showers and change areas, and active residents will appreciate the yoga studio and well-equipped fitness centre. 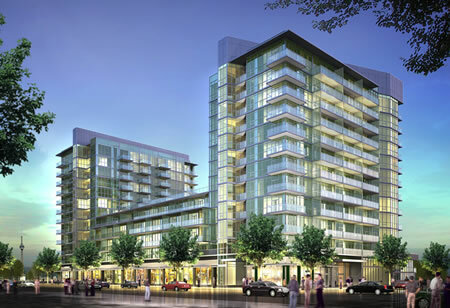 For the ultimate in intelligent urban living, check out IQ Condominiums at the Presentation Centre, 1061 The Queensway, between Kipling and Islington. And prepare yourself for a unique exploration, with 3D renderings on the wall that you can “walk into” for a personal virtual experience. You can also find out more at iqcondos.com.